There’s a freedom that comes from opening a new dealership from scratch. It’s a clean slate, free of any baggage that comes from taking over an existing store. There are no dings on your reputation from past mistakes. Your facility will be new and state-of-the-art. It can be designed to take advantage of new technology. The potential is wide open, limited only by your desires. Fenton Nissan of Rockwall, located in the Dallas/Fort Worth Metroplex, is one of the 19 dealerships that make up the Fenton Motor Group, spanning Kansas, Missouri, Oklahoma, Tennessee and Texas. While the group has Ford, GM, Honda and other brands, nearly half of its stores are Nissan franchises. When Nissan wanted to open a store in the Rockwall area, they came to Brad Fenton. Fenton, who’s been a dealer since 1982, knew his organization would be up for the challenge and gladly accepted the offer, opening the doors of Fenton Nissan for the first time in May 2016. Despite the many benefits of opening a brand-new store, you face one lingering obstacle…no one knows who you are. You’re an unknown entity for one of the most emotional decisions a consumer will make in his or her lifetime. You have no customer base, and you’ll be facing off against competitors in your area with proven track records and loyal customers. Being new poses a challenge; you are the unknown. To succeed, you must prove yourself to the community. 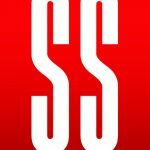 You must be eager to do the work that will not only satisfy the customers who are willing to take a chance on you, but will inspire them to share their experience with others to get your customer base rolling. Finding an experienced team is one factor that will make all the difference in this effort. With this in mind, Fenton put an experienced team in charge of the day-to-day operations of the new store. Mark Esposito, who comes from a long lineage of family-owned dealerships in the Kansas City area, was named the group’s Chief Operating Officer (COO), and Frank Figueredo was made the dealership’s Executive Manager. Figueredo is no stranger to the challenges of getting a new dealership off the ground. His father, one of the first Cuban Americans to own a Chevrolet dealership in the United States, was awarded a point in 1979 in North Miami Beach. Figueredo worked at his father’s dealership after school every day, learning the ins and outs of how each department functioned. Figueredo went on to hold several positions in automotive sales — including consulting work for dealerships in Puerto Rico. With decades of retail experience under his belt, taking on the GM position at Fenton Nissan of Rockwall to help build the dealership was a no-brainer. With a powerful and experienced team in place, the focus shifted to the dealership’s physical facility. Fenton, Figueredo and Esposito knew their facility needed to make a statement — one that let customers know the dealership was serious about earing their business for the long term. Fenton Nissan of Rockwall is now the largest Nissan dealership in the country, with 43 service bays. “We’re the most modern facility right now in the country for a Nissan store,” Figueredo said. However, a fancy facility won’t get the job by itself, though. As the “new kid on the block,” the dealership needed to leverage every advantage and opportunity it had to compete with the several other dealerships in the area. “As an open point, you don’t have that loyal customer base, you don’t have those Units in Operation to feed your service department and you don’t have repeat purchases,” Figueredo said. The dealership’s leaders knew they had to grow roots in the community and become familiar with both business leaders and the customers in the area. Figueredo said the dealership has become involved with the area’s Chamber of Commerce and has implemented community outreach programs to build familiarity with the local area. Recently, the dealership held a back-to-school backpack giveaway for local families as a way to build ties and grow brand recognition. Marketing, of course, is key to letting area customers know the dealership was there to serve their needs. 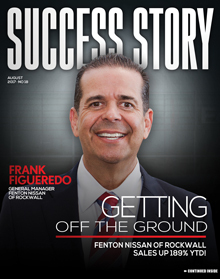 Fenton Nissan of Rockwall’s leadership team knew that partnering with a reputable agency was crucial to grow their brand awareness. After researching companies and deciding what they needed from a firm, Fenton Nissan chose Team Velocity Marketing to plan and execute their marketing strategy. 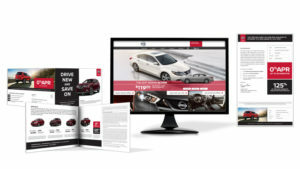 Team Velocity Marketing embraced the challenge, delivering an integrated marketing plan for the dealership centered around growing sales numbers and winning customers. Using the Apollo Technology Platform®, the results were immediate and impressive. Fenton Nissan of Rockwall is up 189 percent year-to-date. New Car Sales are up 289 percent, while Repair Orders are up 160 percent and customer pay is up 372 percent year-over-year. Organizational culture is critical to the success of a new dealership and to overall customer satisfaction. When Figueredo took the position of Executive Manager, his main goal was to make sure all the employees of Fenton Nissan felt like an extended family. The dealership, for instance, has an employee committee who identifies a team member who went above and beyond that month, not just in the dealership but also on a personal level. “We choose a candidate if they did something at their church, if they did something in the community, if they did something above and beyond just repairing or selling a car. We celebrate them at our monthly employee appreciation lunch.” Plaques are also awarded to the salespeople of the month for new and used vehicles, along with the service adviser of the month and others.